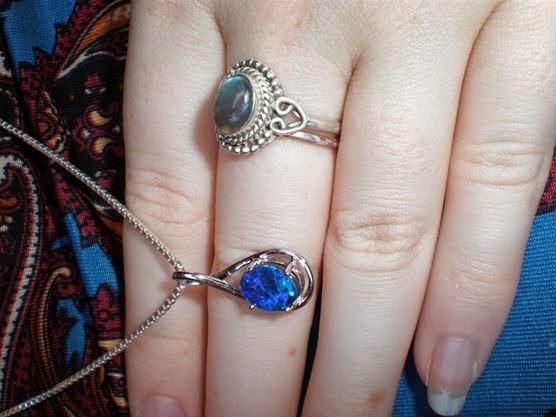 Yesterday I lost my necklace, a beautiful blue opal necklace gifted to me by my parents this past Christmas. I awoke from another disturbed night suddenly aware that the velvet box in which it was encased was no longer on my bedside table as it had been. I searched for it, moving the table, emptying drawers, tidying the pile of clothes nearby to no avail. It had gone. As well as being upset at the prospect of having to reveal that I’d lost this special gift, it made me recall the times I’ve lost other treasured items. Perhaps most painful of all was a tiny silver plaited ring my Grandmother bought me when I was still a child. It was purchased in the gift shop of a local zoo and I loved it because it was real silver and it made me feel grown up to wear it. As I grew older I liked to wear it on my little finger to keep her close to me, a hopeful reminder of the continuity of her existence in my life, long after she passed from this world. The circumstances under which it was lost do not cast the best light on me. I’d been out drinking with my (then new) boyfriend and we’d argued. I was being irrational, emotional, unfair, all fuelled by insecurities brought to light by the consumption of too much alcohol. And I was suddenly aware that where it had been just moments before, it no longer was. I insisted that we retrace our steps, searching in vain along the section of pavement in the dark as people passed us curiously, tears springing furiously from my eyes. Irrationally I felt as though I had let my Grandmother down in that moment. If I could be different, if I could be more responsible, less sensitive, then I’d still have that ring. My losing it came to symbolise what I perceived to be the worst aspects of my character. In the cold light of day I returned to the area where I believed the ring had been lost, hoping that the bright sun that burned my sore eyes would reveal a glint of silver. In fact, it showed up many glints- coins, small pieces of metal, screws – but no ring. I had to reconcile myself to its being gone, just as she was. It is strange how these small tokens come to mean so much. As I reluctantly sent messages to my Mum and Aunt yesterday, wondering if I had left the necklace with them I was struck by guilt again. What if I’d really lost it? This item purchased while my parents were travelling last year? It was a gift, not only special due to its value, but also because it was from a time of great happiness. Fortunately, just as both women responded telling me there was no sign, the necklace was discovered among the belongings in my room. My anxiety dissipated and I breathed with relief opening the box to reveal the bright blue jewel. It seemed to shine brighter than ever before.